Though most of us love shopping, very few of us show just as much enthusiasm while shopping for our homes. The kitchen gets very little respect in that matter. Most of us have the same cook ware and utensils that we’ve been seeing for ages. Some of us even have things we inherited from our parents or grandparents. If cooking utensils were people, they’d be very old people tired of seeing each other’s faces for decades. 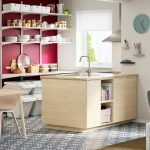 Let’s not even talk about kitchen furnishings – hardly anyone thinks of buying new curtains or towels for the kitchen. Well, it’s time to change all that. Try refreshing the look of your kitchen with a new set of curtains or table spreads. Add a vase or two and if possible get some potted plants or herbs for the windowsill. Buy a cute little cookie jar or a new set of coffee, tea and sugar containers and put it on the counter. Have fun with your collection of plates and mugs with a few pieces in a completely different colour. 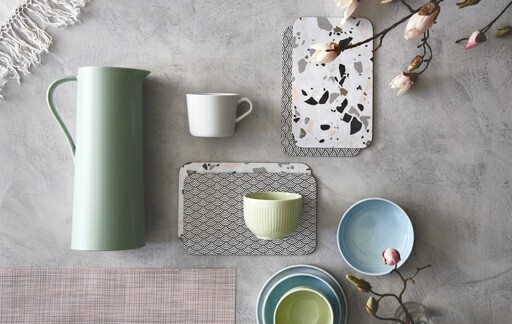 If you have plates in white, then try adding a few serving dishes in mint green to the mix. Add a set of mugs in sunny yellow or other vibrant colours for more fun. A big water jug in a bright shade could set the tone for the counter too. Cooking accessories are an often ignored part of cooking. Yes, most of us are masters of working with the bare minimum. However, only once you’ve tried it will you know how much easier life gets with the right kitchen accessories. Pot stands, strainers and lids are not glamorous by any means, but you know how useful they are. Things like steamers on the other hand become more useful as they go along. There will always be something worth steaming in the days to come therefore buy one and see how often it’s called to duty. Pasta and boiling inserts will seem like genius ideas in days to come. Go ahead and buy a few new pieces. You’ll see how much better you feel in an updated kitchen even if the changes are tiny.